Bringing new people into your organization is an important (and inevitable) part of growth. Each new person is affected by—and affects—the culture of your brand. Leaders with a clear understanding of their brand strategy have hired people according to core values, and the result is a deeper, richer culture. New employees meet existing teams, find connections, and work together in task and attitude towards a shared purpose. The brand continues to thrive. Theoretically, it works seamlessly. Realistically, new people are outsiders until they are trusted by the team—not the implied trust of carrying the same banner, but rather the type of trust that is earned through shared experiences and challenges; through learning about each other as people, not just roles in the organization. Each organization finds unique ways teams connect. There are no rules, limits or fool-proof best practices for finding the trust every team requires. For some it’s social events; for others it is working through a full cycle of a project or deadline together; for others there are relevant (or obscure) rituals and milestones that need to be reached. For many it’s a mix of a few things. An organizational culture is inevitable. Too often, though, it is often accidental and thriving on the path of least resistance. Who is feeding your culture? As a leader, do you know the Culture Gateways for your organization? Do you understand—and make time for—the events and rituals that your culture asks of itself? 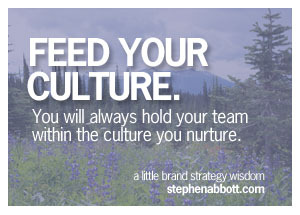 Do you feed your culture, or do you expect it to live off whatever filters through the burden of productivity? New employees can get overwhelmed during even the most thoughtful on-boarding process. New policies, new peers, new possibilities—there is plenty of new information pushing towards fresh members of your team and it’s easy to let the culture component occur accidentally. Smart brand leaders understand that when new employees integrate into the culture quickly, smoothly, honestly and enthusiastically, the benefits are exponentially greater. Trust—the deep trust required to push boundaries, challenge ideas, and risk authentically—is reached sooner. The value and influence of true teams is realized. Smart brand leaders understand and encourage the Culture Gateways that are required by the organization. Whether true planning is required, or simply giving permission and getting out of the way, leaders recognize the resources required—time, space, workload, stuff—and not only let it happen, they make sure it happens. It’s purposeful and measured, not accidental. Smart brand leaders know they get the culture they nurture, and the right culture is at the foundation of brand success. Embracing Culture Gateways—the launch pad to the human side of on-boarding and a rich brand culture—is critical to building a strong brand and is not left to chance. Do you know the Culture Gateways of your brand strategy?